This was in 2009, 57 years after Lindy Remigino had captured the Olympic gold medal in the 100-meter dash in Helsinki. This was at the Sportsmen’s Club on Main Street on a September night when Usain Bolt visited an adoring Jamaican community in Hartford. Two men, the fastest men on the planet, met. “How tall are you?” Remigino asked Bolt, who would go on to become the only sprinter to claim three 100-meter Olympic titles. It was there that two giants of track and field laughed and hugged. 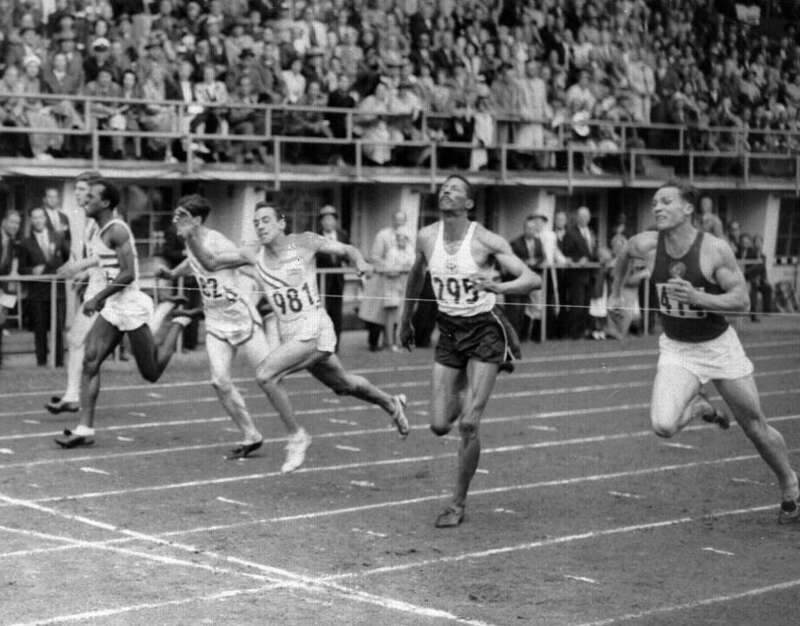 Lindy Remigino, who died Wednesday at 87 of pancreatic cancer, proved he was the fastest man in the world on that July afternoon in 1952. He won another gold on the relay. For this he was given a great parade in Hartford, rode in a Cadillac convertible, and bestowed the city’s medallion of honor, a tribute only Charles Lindbergh and Gen. John J. Pershing had previously received. Yet to know Remigino only as an Olympic champion is not to know this son of an Italian immigrant, born in Queens, named after Lindbergh, raised in Hartford, educated at Hartford Public and Manhattan College. Danbury coach Rob Murray was spot on when he called Remigino the gold standard of coaching in the history of Connecticut. Sure, Lindy was fast, the fastest, but he ran faster to mentor young athletes, to serve as an ambassador for track and field. Sure, Remigino walked with giants of sport, yet it was the way others far less notable could approach and walk with him that help us understand his greatness. A great guy who became the fastest man in the world and a member of 11 Halls of Fame, including the USA Track and Field. A great guy who would hear the Finnish starting commands, “Paikoillane! Valmiit!” who would lean too soon with his chest and endure a 20-minute photo examination of the tightest mass finish in Olympic history. A great guy who would sit there patiently as British journalist Harold Abrahams, the 1924 Olympic champion immortalized in “Chariots Of Fire,” and Red Smith, the American sports writing legend, battled to ask the first question of the little guy who stunned the world over 10.4 seconds. Mike recounted a story how a partner at one of the major Wall Street firms approached Lindy after his Olympic glory, brought him to the Hamptons and offered him a job. When Remigino said he didn’t know a thing about Wall Street, he was told, “That’s OK. We’ll teach you everything.” Surrounded by the rich and famous, he politely declined and returned to Connecticut. “His riches were seeing kids excel in track,” Mike said. Indoor, outdoor, cross country, Remigino’s teams won 31 state championships over 43 years at Hartford Public. He developed an extraordinary number of athletes. He founded the Hartford Public Invitational, a meet that became a major force in New England track. “He dedicated his life to coaching and teaching,” Mike Remigino said. “I saw my father go to kids’ houses in Hartford, where they came from fairly tough homes, to get them to practice, to meets. We were at an event together in November 2016. Marcus Camby, the 1996 national college player of the year at UMass and former NBA star, was being inducted into the Hartford Public Hall of Fame. Camby posed with Remigino and former welterweight boxing champion Marlon Starling, a photo people surely will cherish in 50 years. “I’m in the company of greatness,” the 6-11 Camby said as Remigino made a fist, pretending to punch Starling’s jaw. Yet it was what Remigino said 30 minutes later that was the punch to my gut. Pancreatic cancer has the highest mortality rate among all major cancers. Many lives are claimed quickly. Remigino fought it for two years. He had the love of June, his beloved wife of more than six decades. He had the love of their five children, Patty, Betty, Linda, Kathleen, Mike and their families. He had his love of track. “They call him Lucky Lindy and he’s a lucky man,” Mike Remigino said. “The way you live life is probably the way you die. That’s something the hospice nurse said to me when he died [at the family’s Newington home]. I think it’s true. Weddings, graduations, the induction into the USA Track and Field Hall of Fame, his grandsons’ meets, yes, Lindy Remigino did them. A couple months ago, Remigino got up without anyone knowing to go the garage where drinks are stored in a second refrigerator. He tripped and broke his femur. Perhaps it was fitting that the legs that would carry him to the finish line and Olympic immortality would let him know it was time to say goodbye. Five-foot-six and a giant of a man.